Description: A granite monument is inscribed: "For God And Country ~ And All Who Served ~ In Order That This ~ Nation Might Survive ~ 1943". Description: It was initially reported that: "Post 451 of Bluff City has a 12 foot shaft representing a tree (Comrade A.B.Work left by will $150 to apply to the cost of this monument)." 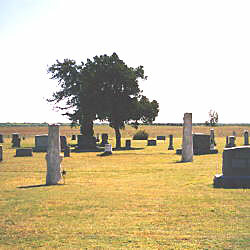 At present, the cemetery has two six foot shafts. 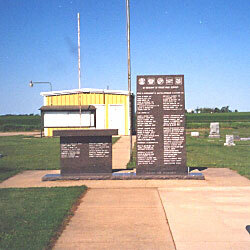 There is also a small granite plaque that reads: "Bluff City, Kansas ~ 1886 - 1986 ~ Dedicated This Centennial Year ~ In Memory of Our Veterans". Description: A pair of dark granite monuments are mounted on a paved plaza in the cemetery. The large monument is inscribed: "In Memory Of Those Who Served". Below that are inscribed 16 names indicated as "CW", 1 name indicated as "SA", and many names labeled as "WW I", "WW II", and "Korea". 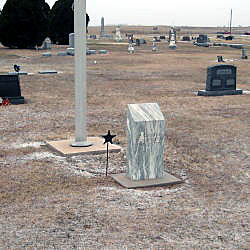 The small marker continues the listing of names, adding "VN". Below the monument is engraved "Lest We Forget". 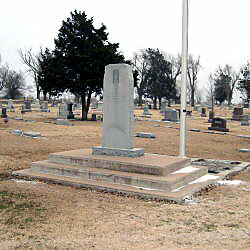 Description: A granite monument is inscribed: "In Memory Of ~ Those Who Served ~ Their Country". 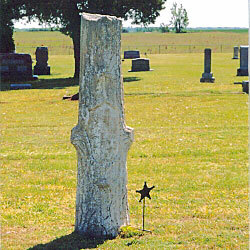 A brass GAR medallion stating: "Department of Kansas, Post 61 GAR" is mounted on a spike next to the monument.